If I had time, perhaps this post would be better organized and more thought-out. However, given the nature of the news-media cycle and the imperative to be timely, I present this post as-is with the reservation that it may be edited for clarity should the need arise. No doubt, this post and position it takes will receive backlash. Firstly, I apologize for the UK-centric aspect of this post. The bulk of the writing is from a UK newspaper, and most of my linked sources are also based in the UK. The unfortunately reality is that the press in the United Kingdom, of all places, seems to have a more critical take on the events unfolding in Syria. Secondly, I understand that the situation in Syria is contentious and that there may be some “pro-opposition” or “humanitarian” individuals and everyday people who are genuinely concerned based on the coverage of Aleppo. This post is, to some extent, for them. In the era of the Chilcot Report and Wikileaks, which has demonstrated that the United States and NATO are willing to develop elaborate lies about any government they consider a threat to their hegemony, I cannot readily accept dominant narratives about Syria. The Syrian state has been under direct attack by imperialism for the last two and a half years (although the US and others have been “accelerating the work of reformers” for much longer than that). The forms of this attack are many: providing weapons and money to opposition groups trying to topple the government; implementing wide-ranging trade sanctions; providing practically unlimited space in the media for the opposition while enacting a blackout on pro-government sources; and relentlessly slandering the Syrian president and government. With a few notable exceptions, the western media and governments have “created this climate that legitimates” a regime change project in Syria. For example, most western and corporate-owned media claims the Syrian government is responsible for the “vast majority of deaths” from the war against Syria — yet NATO military airstrikes, crippling economic sanctions, and CIA-trained rebels ravage the nation. The lone fact that sanctions have been imposed by the west is an act of war. With this in mind, I have provided two samples of an alternative narrative on the war in (or on) Syria, with a focus on Aleppo. It is not my intention to negate the genuine concerns people who are not already self-described anti-imperilaists might have for the people of Aleppo; I have forced myself to resist falling into the cynical notion that liberal concern cannot be directed elsewhere. Instead, by critique is of the “humanitarian” imperialist lens this concern is filtered through to reinforce the legitimcacy of empire and its practices. Eva Bartlett is an independent Canadian rights and justice activist and freelance journalist. She has spent years in occupied Palestine, documenting Zionist crimes against Palestinians in the Gaza Strip and volunteering with the International Solidarity Movement (ISM). In November 2008, Eva sailed with the third Free Gaza Movement boat from Cyprus to the Gaza Strip, where she then joined the ISM in accompanying fishermen on the sea and farmers in the border regions (see compilation video here and her blog posts and reporting here). In both cases, fishers and farmers were violently attacked by Israeli army, injured, killed, or abducted. During the 2008/9 Israeli attacks, Eva and other ISM volunteers accompanied Palestinian medics in Gaza, documenting Israeli crimes, including victims of White Phosphorous attacks and other war crimes. During the November 2012 attacks, Eva documented from a central Gaza Strip hospital. In 2014, Eva twice visited Syria, for a period of a month, taking testimonies of Syrian and Palestinian victims of terrorism in Yarmouk camp, as well as Homs, Maaloula, Kessab and Latakia. She experienced first-hand the terrorists’ mortars on Damascus, including being shot at by a terrorist sniper. She reported on the Syrian Presidential elections from Lebanon, and re-visited Syrian a week after the elections. She has also interviewed the Syrian Ambassador to the United Nations, Dr. Bashar al-Ja’afari. She is also a founding member of the Syria Solidarity Movement, which advocates for a sovereign Syria and against foreign intervention. She speaks colloquial Arabic and rusty French. This story originally appeared in the UK Independent. Emphasis is added. I have also linked a relevant talk by Italian journalist Loretta Napoleoni, which Fisk references. “During the last two weeks, Fatah al-Sham Front [in other words, al-Qaeda] and the Abu Amara Battalion are alleged to have abducted and killed an unknown number of civilians who requested the armed groups to leave their neighborhoods, to spare the lives of civilians…,” it stated. Robert Fisk is the multi-award winning Middle East correspondent of The Independent, based in Beirut. He has lived in the Arab world for more than 40 years, covering Lebanon, five Israeli invasions, the Iran-Iraq war, the Soviet invasion of Afghanistan, the Algerian civil war, Saddam Hussein’s invasion of Kuwait, the Bosnian and Kosovo wars, the American invasion and occupation of Iraq and the 2011 Arab revolutions. Occasionally describing himself as an ‘Ottoman correspondent’ because of the huge area he covers, Fisk joined The Independent in 1989. He has written best-selling books on the Middle East, including Pity the Nation and The Great War for Civilisation. He was born in Kent in 1946 and gained his BA in English and Classics at Lancaster University. He holds a PhD in politics from Trinity College, Dublin. If the US topples the government and turns Syria into a client state, history shows this means infinitely worse conditions for the people. There is no denying this. In the words of Hillary Clinton, it would mean “Killing lots of Syrians“. In addition to my comments above, we should remember that a majority of Syrians conditionally support the government as does the Syrian left. Since I expect many will retort that parties like the Syrian Unified Communist Party are merely puppets of Assad’s Ba’ath party, we should remember that the left’s token favorites, the Kurdish YPG/PYD fought alongside the Syrian Arab Army in Aleppo. Even if one were to believe the absolute plausible worst about the Syrian government, intervention is unjustifiable. This puts the left in a similar position to Saddam’s “weapons of mass destruction” or Qaddafi’s “Viagra-fueled mercenaries“, these are colonial mythologies – “useful atrocities” in the words of Eva Bartlett, that exploit legitimate criticisms and opposition to these governments as justifications for western imperialism. It is saddening to see the left fall head-over-heels into this deception. 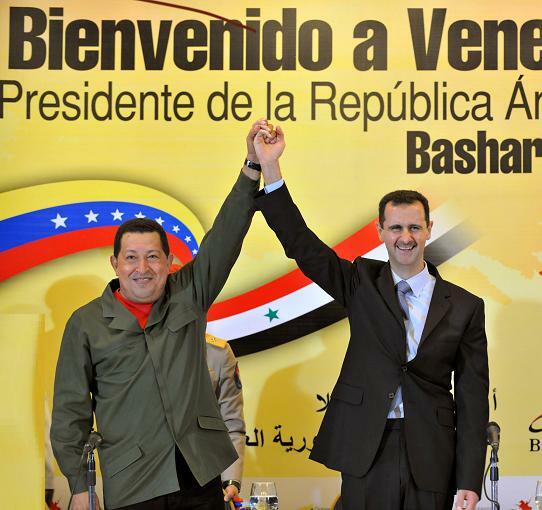 Left movements and anti-imperialist governments in Venezuela, Cuba, Nicaragua (pictured is Hugo Chavez with Bashar Al-Assad) and elsewhere have a much richer understanding of the meaning of solidarity and supporting self-determination for Syria. Though, to be fair to the western left, the PR/ propaganda campaign against Syria has an extremely effective group advocating through humanitarian seduction- the white helmets. Despite having direct ties to the Syrian opposition (and in particular, Al Qaeda) and receiving generous funding and public relations support from western governments, they present themselves as a “neutral”, “humanitarian” arbiter in the conflict. This has had a particular allure to the “establishment” left such as the NDP in Canada. Moral Dualism – Consider the hypocrisy of coverage of the reconquest of Mosul versus the reconquest of Aleppo. Moral Narcissism – what matters most are words and declarations, the positions that stake. It’s not actions that count, what we say we feel that matters most.This is how the White Helmets can call itself a “humanitarian” force while lobbying for western bombing runs, or how said bombing runs can be called humanitarian intervention. Demonization – Yet again we hear “Assad forces”, “murderous Assad”, etc.as typical labels by journalists and pundits, stripping away even the nominal objectivity of the corporate press. While some criticisms of Assad are of course valid and deserve due consideration, these kinds of labels are not concerned with a robust critique of the Ba’athist regime, but with decimating it. It is clear that we are not seeing some sort of exceptional series of events, but instead a project consistent with NATO regime change efforts in Yugoslavia, Iraq, Haiti, Libya, and elsewhere. If you have reached this far in this post and are concerned about the future of the Syrian people, I encourage you to direct the energy you would have put towards supporting the dubious humanitarianism I have described above, and instead put that energy towards helping build the struggle to overthrow colonialism, capitalism, and imperialism. The events in Syria only show that the Empire has no moral high ground; it must be abolished. Once again, I am indebted to Invent the Future and Zero Anthropology for providing a large number of my links and citations. I also highly recommend the “Non-Fake News Syria Reading List” which includes articles from mainstream sources with a critical perspective on Syria. The document is a collaborative project on Google Docs which anyone can provide comments, feedback, and request to edit. Thanks to Dru Oja Jay for alerting me to the project. In light of this situation and the viewpoint expressed above, I am endorsing the Hands Off Syria Coalition in an effort to advocate a just, lasting peace which ensures the self-determination of the Syrian people. I encourage all readers who have had the patience to survive this post to do the same as a first step towards advancing the struggle. Organizational endorsements are especially helpful. There is, unfortunately, no Canadian equivalent to the Hands Off Syria Coalition, several Canadian signatories have signed the Hands Off Syria statement. Hopefully similar efforts will emerge.